A tithi is a lunar day. There are 15 tithis in the waxing cycle of the moon (shukla paksha), and there are 15 tithis in the waning cycle of the Moon ( Krishna paksha). The tithi is based on a relationship between the Sun and the Moon. The first tithi is 12 degrees of the Moon away from the Sun after the new Moon (Amavasya) or full Moon (Purnima). The second tithi is the next 12 degrees of the Moon away from the Sun, 12 to 24 degrees. A particular day is ruled by the tithi at sunrise, but the tithi can change anytime of the day or night as it is not based on the solar day. Tithis vary in duration from approximately 19 to 26 hours, according to the movement of the Moon. Each tithi has a name, a ruling planet, and can be used in muhurta (picking a proper time). The waxing Moon is called Shukla Paksha, the waning Moon is called Krsna Paksha. Paksha is a half month or half lunar cycle. Each Paksha has 15 Tithis, so Shukla Pratipat is the first day of the waxing Moon and Krsna Pratipat is the first day of the waning Moon. In the traditional Vedic calendar system the tithis are used as dates, so one’s birthday would be on the same tithi as they were born, the relationship between the Sun (Father) and Moon (Mother) would be the same on one’s birthday as it was the day of birth. In this way, the Gregorian dates have no astrological relevance. This is a nice visual, so one can connect the meanings with the actual phases of the Moon. In picking a Muhurta one must understand the difference between Nakshatra and tithi, both relate to the mind. The tithi is ruled by Jala Tattva (the water element/Venus) and shows the state of the mind; whether it is excited, bored, nervous, afraid, agitated or calm. The Nakshatra is ruled by Vayu Tattva (the air element/Saturn) and shows what the mind will experience; whether it is going to be a pleasant or painful experience. The tithi is used to see if an event will be successful. It also shows whether people will cooperate with the project or not. The rulership of the tithis is based on the days of the week; Sunday (Sun) rules the 1st day, Monday (Moon) rules the 2nd , Tuesday (Mars) rules the 3rd tithi, Wednesday (Mercury) rules the 4th tithi, etc.Fasting on Ekadashi will get one over anger, because Mars rules it. Krsnas fast on the 11th tithi to be perfect peaceful Vaisnavas. No one will fight with the one who has done this fast for some time. Fasting on Ashtami will make it so you never cheat anyone, so will not get cheated. Fasting on the full Moon will give you truth as it removes the negative effects of Saturn. Trittya tithi (3rd ) is ruled by Mars but as it is Jaya (ruled by akash/Jupiter) so it will bring two people together, as akash is the binding force (that keeps the jiva in the body). Ekadasi tithi (11th ) is ruled by Mars and it is Nanda (ruled by fire-Mars) so the fighting is very strong. Mars is passionate, energetic, and creates conflict, it is not good for marriage, though it is good for war and leadership. For a person born in Nanda tithi, see what’s placed in Aries and Scorpio, look at the planets, and Arudhas. Tithi is about relationship, if Rahu is in Aries the person will have trouble from a widow/foreigner/eccentric in relationships. It shows important learning experiences in life. If a person is born in Nanda tithi, and Venus is in Scorpio, then the person will be likely have relationships outside of marriage. If the A10 is there the person will likely come from their work, A9 and it will be with Gurus, teachers, educators, if the A11 is there it will be with friends, etc. The Arudha shows where the problem will come from or where the person comes from. The house will also have a connection. When certain Tithis line up with specific Varas (days) they are considered auspicious and therefore work on those days is accomplished successfully. If Pratipat (1st ), Shashti (6th ), or Dwadashi (12th ) fall on a Friday, it is considered auspicious. SUN. MON. TUE. WED. THUR. FRI. SAT. In the same way there are certain combinations that are inauspicious, where there will be hurdles in accomplishing works. These inauspicious Days have been called Dagdha, Visha, and Hutashan. Varahamihira connects each tithi to a deity. Understanding the significations of the deity will also give a deeper meaning to each tithi, so that it can be used better in Muhurta. Each tithi rises and sets at a different time. One can be aware of the Moon rise just by knowing the phase of the Moon. 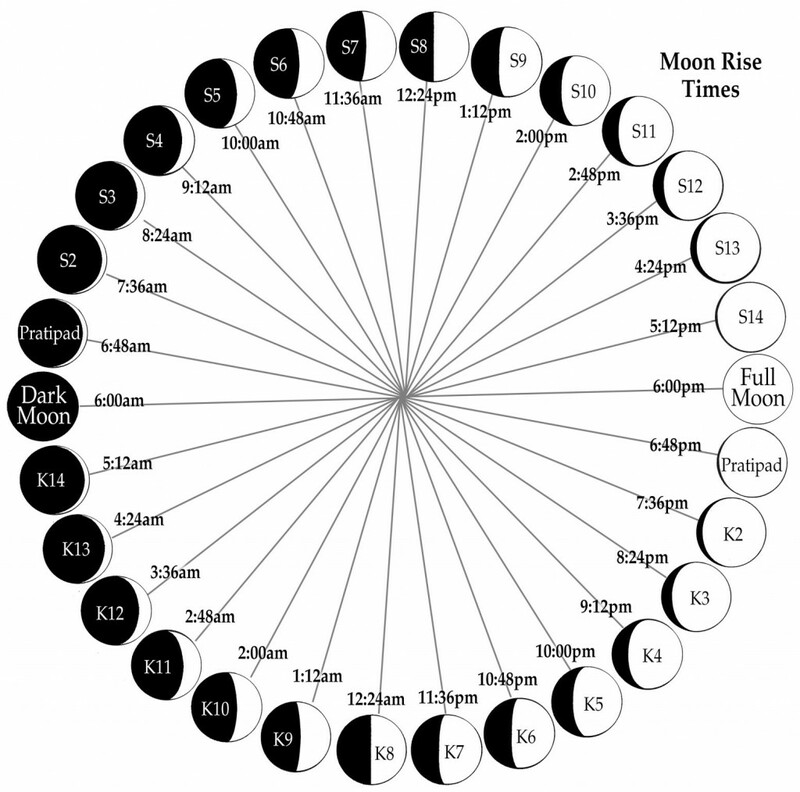 Below is a moon-rise-dial that lists the approximate moon rise times for each tithi. The calculation is for the equator, on the equinox (sunrise and sunset at 6:00), with no lunar anomaly. Local rise times will have variation up to an hour. To learn more about tithis, look inside the free vedic calendar.